Most Krabi pool villas are built in the contemporary Thai style, with pitched roofs, warm neutral colours, dark woods, and rich jewel-toned accents. This type of home has a wide appeal, as it combines a classic style with many visitors’ expectations of how a luxury Asian villa should look. But following on from trends in other Thai beach resort areas, such as Hua Hin and Phuket, Krabi is now starting to see some more modern architecture making an appearance. The three-bedroom three-bathroom Baan Alessandra in Nateen village, the latest addition to Krabi Riviera’s villa rental portfolio, is a great example of this modern tropical style. Krabi Riviera has been managing and renting pool villas in Krabi since 2001, and this – their fourteenth villa – represents a new departure for the firm. Baan Alessandra’s hip, flat roofed exterior is combined with polished bare concrete walls and full length windows to create a calm and soothing living space that maximizes natural light. All rooms open directly into the garden; sliding doors create a seamless fusion of indoor-outdoor space. Furniture has been kept to a minimum, with just a few statement pieces and the use of built in units, such as the white granite dining island, to avoid clutter. Even the garden, with its geometric walkways and planters and rectilinear swimming pool, exudes a sense of zen-like calm. 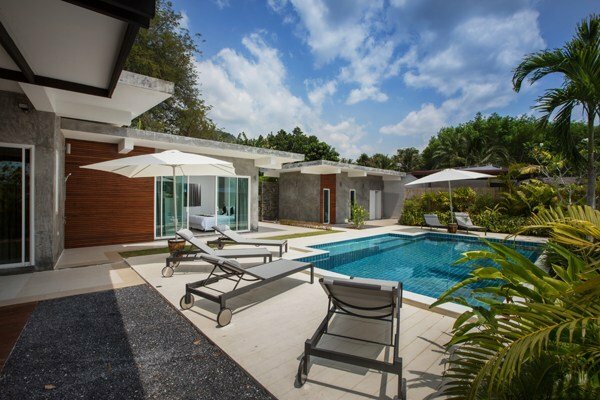 Baan Alessandra’s hip, flat roofed exterior is combined with polished bare concrete walls and full length windows to create a calm and soothing living space that maximizes natural light. All rooms open directly into the garden; sliding doors create a seamless fusion of indoor-outdoor space. Furniture has been kept to a minimum, with just a few statement pieces and the use of built in units, such as the white granite dining island, to avoid clutter. Even the garden, with its geometric walkways and planters and rectilinear swimming pool, exudes a sense of zen-like calm.